I have said it before; I really like set 8081. It has so many possibilities for improvement. After talking a look at RM8‘s design, I thought I should do a street version of the 8081 to follow up on the 4×4 8081 I built a while back. I took the existing bodywork and frame of the 8081, and chopped out the rear suspension unit to revise the rear suspension design. I wanted an independent setup with a differential. As I have used a couple of times before, I used a floating differential design. The differential is attached to the driveline much like a live-axle set up, but is connected to two independently mounted wheel hubs. I have used this before, and I like the way it works. It allows for a driven axle with independent suspension in a very narrow setup. This way each wheel can move independently, but it does not require two universal joints on each side of the differential. Since the differential is not fixed to the chassis, it has to be braced to the driveshaft. 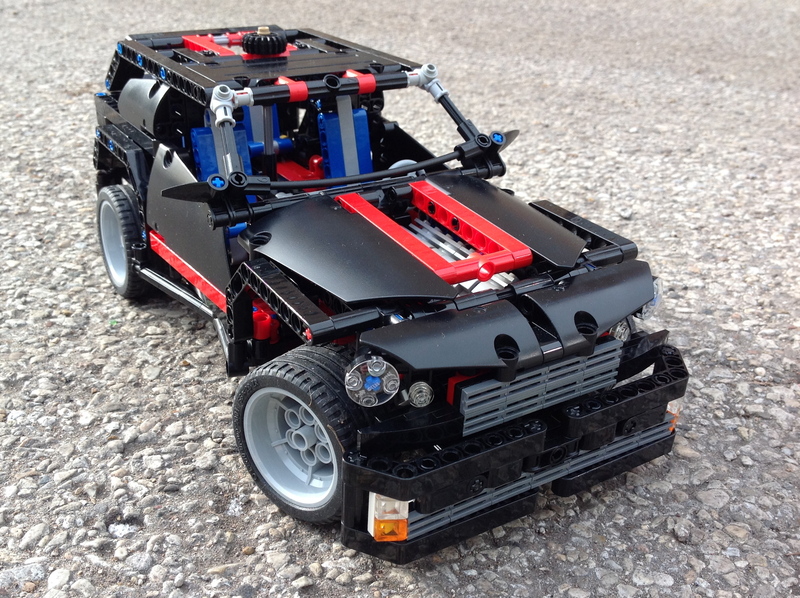 While this set-up is not often used in real cars, it works well for LEGO designs. I used the new wheel hubs, and attached them via a short upper arm, and a long lower arm so the camber would change through the suspension travel. Moving to the front, I kept the V-8 as in my 4×4 8081, and built the rest of the front around the motor. I used a suspension design similar to 8081, where there are two equal length arms holding the steering pivot. 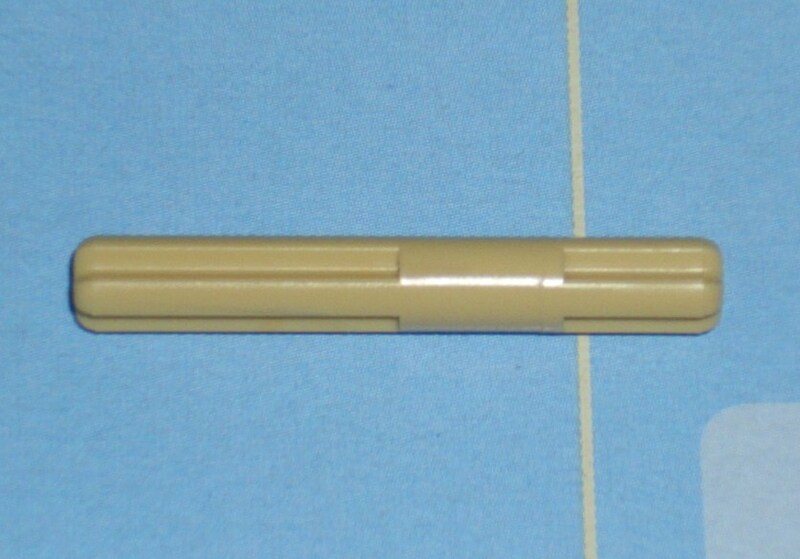 A single shock absorber is used for each side. All told, the car is about two studs lower, due to the new suspension, and the new tires. It is not much of a redesign, but sometimes I need a project that is not a significant, and allows me to just build something simple. Every once and a while I see something so creative I have to build something like it. I happened with my HH-65. It happened with my Zil 132. And to some extent it happened with my Spitfire. But when I saw the Urban Buggy from Chrismo, I though I have to make something like it. It was such a fresh and creative design. It had such great lines, a perfect stance, and a unique driveline setup. But while imitation and outright plagiarism are the most sincere forms of flattery, I thought something of my own design would be a better contribution to the LEGO community. I present my Talon Track Car. You may find the full gallery here, and the instructions here. I designed this car to be fast and stable, just like a track car. I started with a drivetrain that would be reliable and effective. A PF XL for drive, and a PF M for the steering. I placed the PF M in the front mounted directly on the suspension unit, with a return to center spring in the middle of the mount. The system is set up differently than in my Rumble Bee, but uses the same return part. Each suspension arm would have a single shock absorber. Directly behind the steering motor was the XL for the drive. It was geared up with a 20z/12z ratio, with the driveshaft connecting directly to the 20z gear that turned the differential. The rear suspension used an independent setup that was developed a long time ago for my Red Car Bigger (great name, huh). If it’s not broke, don’t fix it. The suspension was planted. I placed the rechargeable battery box and the IR receiver behind the rear axle. The car was quick, and didn’t have any problems, but faster would have been cool. The return to center system worked well, especially for the quickness of the car, and the quickness of the steering. It was easy to control. The car was robust, and crashed well. So go ahead and build your own. Enjoy. For some of you, this may come as no surprise, but I like to build with more than only Technic. 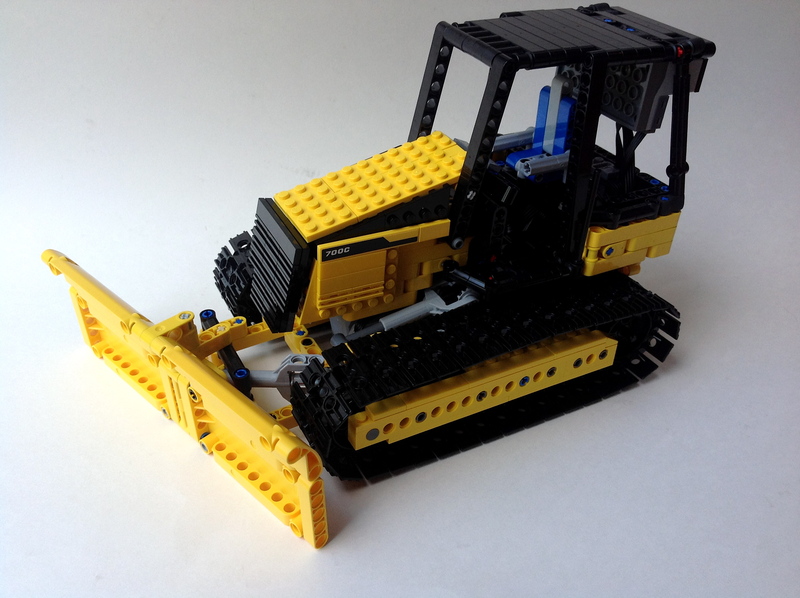 I find a lot of enjoyment building with Technic, but as a child I had more fun with the bricks. My resources (and bricklink.com) now allow me to build some of the things I never could at that time. To this day I still like making tanks, so I present to you a model of the Sd. Kfz. 173 Jagdpanther. 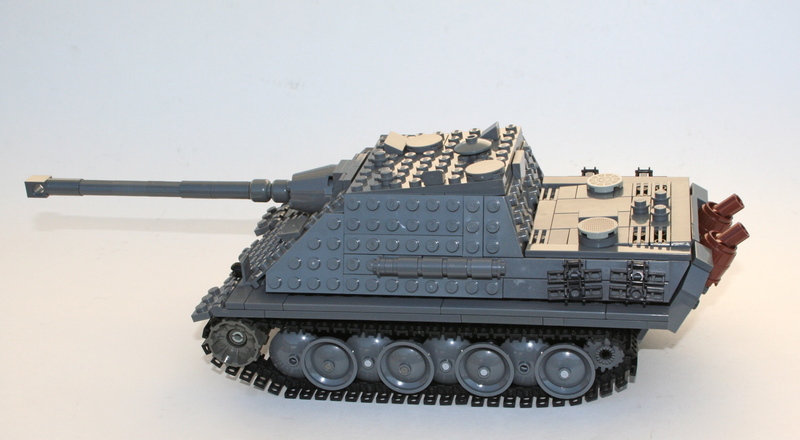 This is still one of my favorite tanks: simple lines, great stance, decent performance, and for my purposes, able to be made in LEGO. Building instructions may be found here. While I love building tanks, I don’t build them often. Posting a tank to the LEGO community online is asking for trouble. There are a lot of builders like me who like to build tanks, so it is hard to make a tank that doesn’t take some influence from someone else. While the design is mine, there are a lot of ideas from others that have influenced this design. Feel free to take a look as some of the ideas in this gallery. Thanks to the various builders. I have some more Technic models in the queue, so until then, enjoy this break from normal. The full gallery may be viewed here. Thanks for reading.